Even though I spent some time in Brazil, the first time I was introduced to açaí berry was in London. I went to dance Zumba at Maloca and there I saw people eating what looked like hot chocolate in a bowl with some granola on top. I was intrigued. I chatted to the owner and discovered that the ‘hot chocolate’ was in fact açaí berry. It was delicious. I used to put in my order before my workout and my açaí was waiting for me when I finished. I still have fond memories of that place. Açaí berry looks similar to a grape. It is small, round and purple-black. The fruit grows on an açaí palms found in Brazil which are also used for their hearts of palm. The fruit has almost no sugar and so it is very bitter to taste. In the past, açaí berry has been described as super food and linked to a number of health benefits including energy boost, skin health and weight loss. Although these claims have largely been unsubstantiated by scientific literature, açaí berry does contain omega 3, 6 and 9 fatty acids and Vitamin A all of which are good for us. 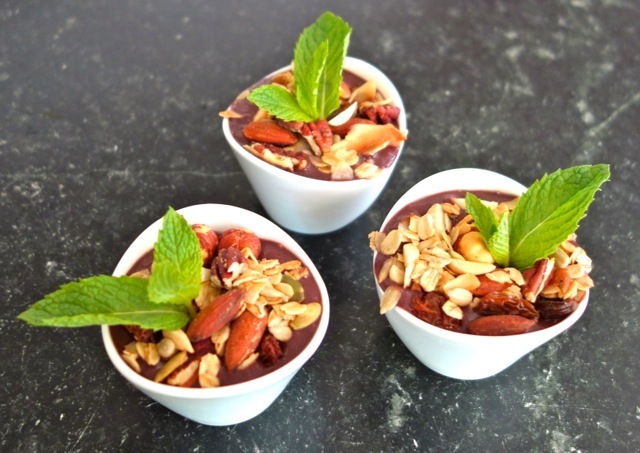 For this recipe I use frozen unsweetened açaí purée which can be found in Wholefoods. If you need an extra kick from your snack you can try the frozen açaí purée with guarana. Guarana has caffeine which will give you the extra boost you are looking for. The granola in this recipe is my own. I love granola and for a long time I followed the traditional granola recipe. It was such a shame that something I loved had so much sugar in it. So instead of giving it up I experimented making it without any maple syrup, honey, apple sauce or anything that would add extra sweetness. To my surprise it tasted really nice. These days I do not even notice that my granola is made without the sweet ingredients. I think for me granola is more about the crunch than the sweetness. 2) Take out the pieces of frozen açaí from the packaging, put in a blender together with a banana and the honey. Blend until smooth. 3) Pour into a bowl or small pots and add the granola on top to your taste. Tags: Açaí palm, acai, acai berry, Brazil, Fruit, Granola, London, Maloca, Weight loss, Zumba | Permalink.